Here I am moved into our home and made my first card in my new craft room, life is good! We have a few things to finish like 2 bathrooms and Kitchen countertops. Being my husband is a plumber it seems the plumbing is last to be completed. lol We have some smaller things to finish and re-do and still unpacking and waiting for hubby to build shelves to put things on. I am so anxious to share photos of our home with you but patience is needed until it is complete. I must say a huge thank you to my crafting friends, huge hugs!! This is what my family felt, your prayers and support during this difficult time, also the generous giving of craft supplies to me so I can pick up and craft. Of course I added to it as things came on sale but overall as I put the supplies away, you are the ones that filled my craft room. You also filled my life with hope and joy, thank you all from the bottom of my heart! 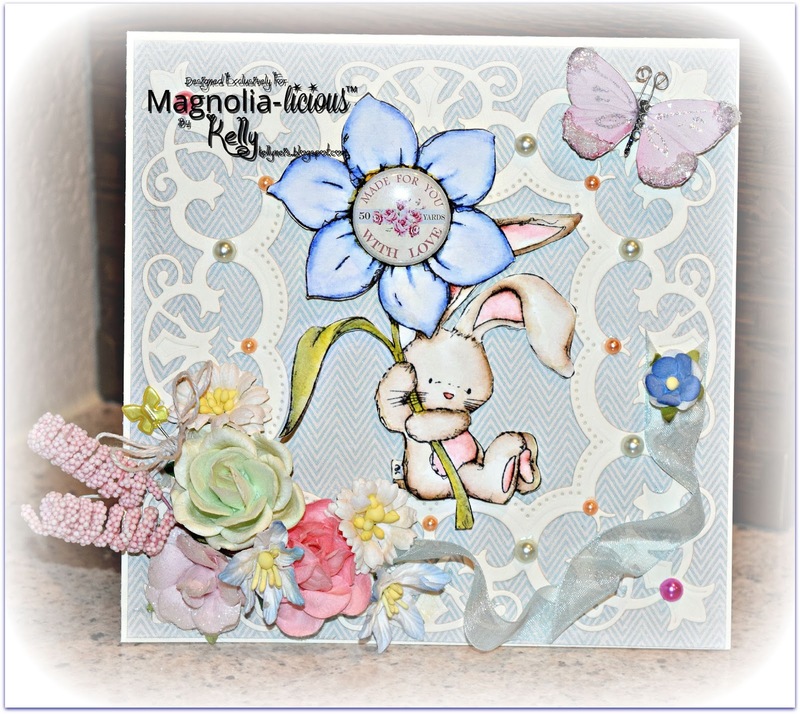 I love this bunny so much from Crafters Companion which is available here at the Magnolia-liciious store. 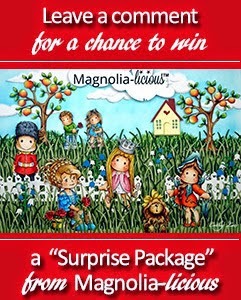 You can purchase the entire set at the Magnolia-licious store for a discounted price. I colored BeBunni in Distressed Inks, playing with some of the new colors. I also found a perfect combination of paper and brushes for water coloring, it is like silk, they just flow together. The Langton watercolor papers found here and the brush is Escoda Reserva series found here. My papers are Maja Summer Crush and I used Spellbinders Imperial Square die for the outline. My embellishments are from you my crafty friends, thank you so much! Please join our newest challenge at Magnolia-liciious Add Roses. The more you comment on the designer blogs, the better your chances are to win a prize from Diana. Pretty easy. Thank you for stopping by today and for sticking with me this year. I hope to have some photos soon for you of our new/old home. This is cute, cute, cute Kelly! Sweet little bunny and I love the flower center. Really pretty paper too, it almost looks like fabric. Glad to hear you are finally getting a bit settled into the house. It`s been a long journey for you guys and you will enjoy this so much! You are an enabler, just bought the brush and paper. It is hard to find \Hot Pressed paper. It is so smooth and lovely to paint on when you don't texture. Your crd is very precious. I love how you have framed the bunny. Is this a die? Beautifully done Sugar! Tickled for you that you are moved in. We moved in the middle of April - had to live in a motel for a week while the painters finished. I am still trying to make this our home. It is coming together more every day. The craft room is a little more of a problem - completely lost my Halloween Paper! Your makes have always been beautifully designed and executed Kelly. I have been following you for some time - what a life you have led! I'm so happy for you that you've managed to move in (the plumbing will get done eventually! ), and delighted that your craft room is ready for action. 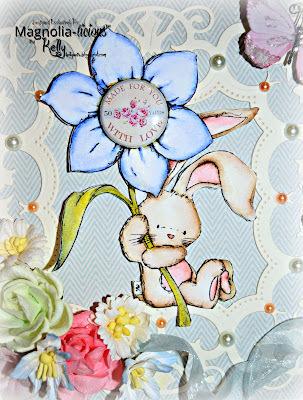 And it's a delicious first card - that bunny is too cute! This card is too adorable! So precious and the soft colors are perfect.